Note: Disk Format options will be greyed out for NFS datastores. Note: If the VA fails to deploy - i) Check port 902 from client to the host is open. ii) Check DNS resolution for the host from the client. Size the Balance VA as appropriate! Note: Alternatively, connect via http to a DHCP generated IP address. 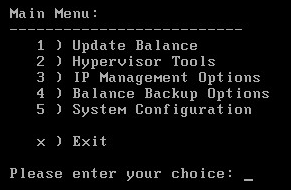 Finally, login to OnCommand Balance!